You wanted online appointment scheduling software for allied health. Simple practice management software you’ll love. You didn’t join the health industry to spend your days under a mountain of paperwork, so don’t. Break free and let us worry about the grunt-work. 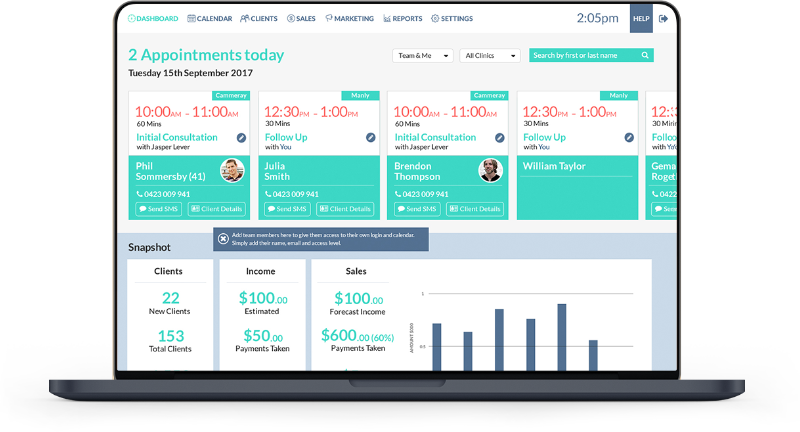 You’re in the business of ensuring your clients get the best out of themselves, Better Clinics is here to help you with cloud based appointment scheduling. Better Clinics brings it all together so you can manage your team, clients and business like never before. As a Reckon product, Better clinics has the serious backing needed to make it a leading solution. Reckon is an ASX listed leading Australian accounting software and business solutions provider with over 250 employees and a partner network of over 6000. Reckon is sharply focused on supporting small business and recently announced an exclusive partnership with the Australian Physiotherapy Association (APA). So you can be confident that you are in excellent hands with Better Clinics and the Reckon family. Better Clinics is accessed over the internet through your internet browser (i.e. Chrome, Safari, Firefox, Internet Explorer). Which means you always have the latest version, can access your practice from anywhere and you don’t have to download/install any software. Say goodbye to backups or worries about your computer getting stolen, damaged or lost. Better Clinics is accessed via the internet and your data is safely stored with Amazon Web Services – one of the world’s top hosting providers. Our product strategy is to continually evolve the product, often releasing new features and upgrades on a weekly, if not daily basis. Being web based software you don’t need to install upgrades, we do the work for you (so when you log in next time you may be pleasantly surprised!). With your practice information & calendar kept in a central location, you can have multiple users logged into your account at the same time – any changes you make update instantly. You can also easily share valuable practice information with an accountant or business adviser to take your practice to the next level. One of the many benefits of the Better Clinics software is that you can access your clinic information securely over the internet from anywhere – from your clinic, office, studio, the oval, cafe or even the beach (our personal favourite)! Never leave anything behind again. Here’s the clincher – say goodbye to your IT guy. As we look after all the software updates and the hosting of your data, there is no need to call your IT guy for problematic software installations.